Folgunthur is a medium-sized Nordic ruin located southeast of Solitude. The ruins have two interior zones: Folgunthur and Folgunthur Crypt, which houses the tomb of Mikrul Gauldurson. The deserted camp of Daynas Valen and his group of hired adventurers just a few paces west of the entrance. It consists of four small tents each containing an unowned bed roll arranged around an extinguished campfire. One of the bed rolls has his journal on top. 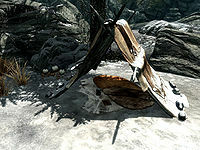 There are several deathbell plants, a canis root and a couple of swamp fungal pods around the camp and near the entrance to the ruins. Further to the west, near the shore is another deserted camp, that if you come here from Solitude and swim across from the docks you are likely to stumble upon. It is under an overhanging rock formation and consists of two hay piles, an extinguished campfire with a functioning cooking pot hanging over it and several crates, food sacks and barrels. On one of the crates is a copy of the Pickpocket skill book Purloined Shadows. The area in front of the entrance is covered, with a stone table to the left of the door. On the table is a filled random soul gem and flanking the table two burial urns. To the left of the table is also stone bowl containing a large coin purse. For a short while you are simply following in Daynas Valen's footsteps, encountering the hired adventurer's bodies and dead draugr on the way, and meeting no enemies almost until you find Daynas himself. The entrance leads into a passage flanked by large statues, there are bone chimes hanging down in front of a doorway ahead and stairs leading down to the north beyond. At the bottom of the first flight of stairs is a pressure plate, the body of one of the adventurers and several dead draugr. The pressure plate triggers a spear trap from the statues on either side. Two burial urns are found in one of the alcoves by the statue on the right. Another flight of stairs descends to a doorway at the bottom, there is a keyhole for a dragon claw on the left. Through the doorway is a room with a central stone table with a plinth in front that has another claw-shaped keyhole in the top, as well as four rotating pillars and matching symbols, that have been solved in order to raise another gate in a doorway to the north. On the table is a pickaxe and an empty random soul gem, with a second pickaxe on the floor. There is another dead adventurer and several more dead draugr around the room. To the left of the table is a burial urn and an open crate containing a bottle of alto wine, a tomato and two loaves of bread. To the west is a broken sideboard with a random potion of magicka beside it and further back a set of shelves holding a random pair of gauntlets. To the east a concealed door with yet another claw-shaped keyhole to the left of it. You will need the ivory dragon claw in order to open this door. There is a burial urn beside it for storing any spare items while you explore. Through the door to the north is a passage with another pressure plate a few pace along that triggers a flame spout trap from the statue at the corner ahead. There are the burnt remains of another adventurer on the ground. Just past the corner is the first living draugr. After another turn the passage enters a two level room containing several sarcophagi. There are two oil slicks, one at either end of the room, with an oil lantern above each of them. There is a long stone table near the middle with two dead draugr and a burial urn beside it. As soon as you enter, the gate behind you will close and several draugr will emerge from their sarcophagi. Once defeated there is a chain to the right of the doorway that raises the gate and sideboards on either side. The one to the right when facing the gate has a random shield on top. At the western end of the room there is another dead draugr and adventurer, with a copy of the One-handed skill book Fire and Darkness beside them. To the right of them is a passage that leads to a stone table with a random set of armor, a random mace and a large coin purse on top. At the northern end of the room are some sets of shelves and a stone table holding a random mace and helmet. There is also a doorway leading to a wooden spiral staircase. Which has a trap door at the bottom the opens over a flooded shaft. At the bottom of the shaft is a spike pit, with a small coin purse and a random greatsword among the spikes. There is a handle under the water and a lever with reach when in the water that aids you getting back out. However, followers may have trouble making it up the stairs. If that happens, you can always continue on and they will appear beside you at the beginning of the next zone. At the top of the stairs you re-enter the previous room on the upper level. Crossing a wooden bridge to a central area where there are three dead draugr, yet another dead adventurer and the body of Daynas Valen. He carries the ivory dragon claw and his notes, which provide some additional background on Gauldur and his sons (and advances the Forbidden Legend quest if you have started it), but don't appear to be necessary to finish clearing the dungeon. His body is leaning against another claw-shaped keyhole, which when activated with the ivory dragon claw lowers another bridge on the opposite side to the first and allows you to continue. Keep the claw as it is required to unlock the puzzle door further on. When the bridge is lowered, two draugr standing in some catacombs beyond are revealed. Across the bridge is a junction with a pressure plate that triggers a spear trap from the sides in front of a short passage to the left. There are two dead draugr standing in alcoves along this passage, with an adept trapped chest that triggers a poison dart trap if opened without disarming and a random potion of resist element at the end. To the right, there is a slumbering draugr standing in an alcove opposite and another on your right, with a dead draugr standing in an alcove to your left. There is a broken table to the right with a random war axe on top. To the left is another area with a slumbering draugr standing in another alcove ahead and a large urn in an alcove on the right. In the center is a lit brazier and to the northwest a short passage with two levers on either side and a series of lowered gates ahead. Each lever opens or closes one or more of the gates. To open all gates, pull the first left-hand and second right-hand levers (the puzzle is reset when all levers are pointing down). Once past the gates the passage descends a flight of stairs, towards the bottom they become much wider and there has been a cave-in on this half, among the masonry is a large urn, a random poison or potion and a random warhammer. As you move to the right and the other half of the wider stairs a rockfall is triggered which rolls down the stairs in front of you and may damage a draugr standing at the bottom. Behind the draugr is a closed wooden door. Through the door is another room containing two thrones, both occupied by draugr, who awaken as soon as you enter or if you use a ranged attack on either of them from the doorway. Between the thrones, against the wall is a set of shelves and in the middle of the room is a large trap door with a stairwell underneath. On the far side of the room there is a doorway, but the passage beyond has caved-in. To the left of this is a stone table with an urn to the left of the table. There is a lever by each of the thrones and a chain opposite them. The levers operate large rotating stones that block one of two doors in the corners behind the thrones, so that one door opens while the other closes. Entering the first of these rooms causes two draugr to burst from upright sarcophagi in a small area at the rear of the room. There are three symbols in this room. Starting from the entrance, they are Snake—Whale—Hawk. You need to mirror these symbols on the rotating pillars in the second room. This second room has another draugr and a spellcaster trap that shoots Lightning Bolt if triggered by standing on a pressure plate near the back of the room. Remove the soul gem to deactivate it. Opposite the pillars is a stone table with a filled random soul gem on top. Once you have them in the correct order pull the chain in the main room to open the trap door in the floor and gain access to the stairwell. If you pull the chain when the symbols are in the wrong order you will trigger a poison dart trap that fires from above it. The stairs seem to descend forever to reach the bottom and a shallowly flooded passage with two frostbite spiders wandering it. There is a deeper section on your right, with a leveled greatsword under the water. The passage ahead rises and passes a burial urn on the right. At the top there is a small set of shelves on the left with a random cuirass and a stone bowl on top containing an empty random soul gem and a larger set of shelves on the right holding a random potion of healing, a random dagger and a leather strip. The passage ahead has three sarcophagi on either side, an urn on the left and a puzzle door at the far end. As soon as you enter the door will close behind you, the passage will darken and the sarcophagi will burst open, two at a time. Allowing you to deal with each pair individually. Once they are all dealt with you are able to reopen the door behind you if you wish. The puzzle door has the combination of Hawk—Hawk—Dragon from outermost circle inward as per the inside of the ivory dragon claw. Beyond the door is a passage with an urn and burial urn on your right, a stone table in front of you with a small coin purse, a random sword and helmet on top. To the left are double doors that lead to Folgunthur Crypt. Upon entering you are in a passage at the bottom of a flight of stairs, at the top is a small unit with a random warhammer, gauntlets and potion of healing on top. To your left is a large opening into a large chamber with several pairs of pillars supporting the roof and in between these is a sarcophagus containing the remains of Mikrul Gauldurson. He will arise as you approach along with several draugr thrall, these will be replaced by others as they fall from the twelve sarcophagi around the chamber. They are different from normal draugr in that they carry no weapons, only a few septims each. Once you defeat Mikrul any remaining draugr thrall will also perish and any that haven't risen will burst from their sarcophagi dead. Mikrul's corpse contains the Gauldur Blackblade, a Writ of Sealing, and a Gauldur Amulet Fragment (a quest item for Forbidden Legend). The first half of the large room is devoid of anything of interest. There is a single urn on the right among the sarcophagi, a burial urn at the rear on the right and two flights of stairs at the rear blocked by spears. Both are lowered using the ivory dragon claw in keyholes either side. There has been a cave-in behind spears on the left and a burial urn and medium coin purse can be found among the rubble. The stairs on the right lead up into a room which may contain a dragon priest and two draugr. It does contain the word wall which teaches part of the Frost Breath dragon shout. At the top of the stairs there is a set of shelves and a small unit on your right. On the shelves are many ruined books and a couple of coin purses (see bugs). In front of the word wall is a stone table with an unlocked boss-level chest, a random one-handed weapon, gauntlets and shield, a random potion of healing and poison all on top. An iron door at the rear of the room has a random greatsword on the left (see bugs). 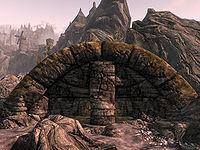 The door opens into a tunnel with a random potion of healing, magicka or stamina beside a lit brazier partway along it and at the top a sarcophagus lid you activate to open, brings you out at the junction by the bridge you lowered with the ivory dragon claw. You can jump down from here and retrace your steps. Back in the first room don't forget the concealed door that can be opened with the ivory dragon claw, behind this door is a small room containing an apprentice-locked chest. Sometimes, you will be unable to get the Frost Breath word from the wall and the sound will loop repeatedly. It may resolve itself if you return once everything has respawned. The last gate when exiting back into the entry area sometimes gets stuck and cannot be opened with the lever if it is closed. Turning the console off and reloading the game fixes this issue. The coin purses on the set of shelves in the room with the word wall may be invisible, although it is still possible to pick them up. ? The random greatsword by the rear door to the word wall room may be floating at waist height due to a glitch. This page was last modified on 13 April 2019, at 01:00.